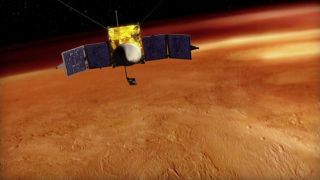 The Mars Atmosphere and Volatile Evolution orbiter, or Maven, got back on track for a Nov. 18 launch on Thursday (Oct. 3), just two days after the government shutdown froze liftoff preparations and put a scare into planetary scientists around the world. The shutdown — which went into effect at midnight EDT Tuesday (Oct. 1) when the Senate and House of Representatives failed to agree on an emergency spending bill — forced NASA to furlough 97 percent of its employees and cease most of its operations, including work on missions such as Maven that have yet to leave the ground. So the $650 million Maven missionwent into a worrisome limbo in the home stretch of its long march toward launch. A lengthy shutdown could have caused Maven to miss its liftoff window, which officially runs through Dec. 7 (though the spacecraft could actually launch as late as Dec. 15 or so, Jakosky said). That would be a big deal, because the next opportunity for Maven to get off the ground won't come until early 2016, when Earth and Marsare once again properly aligned.